The opening strum of Seeker Lover Keeper transports you to a sanctuary surrounded by a beautiful garden floating on the water, filled with the sounds of a choir. This delicate collaboration of these three individual singer-songwriters is like the prettiest flower you have ever smelt. Seeker Lover Keeper is a gorgeous, harmonious and captivating listen, created and crafted by three of Australia’s most talented female musicians. Holly Throsby has four lovely and charming albums. Sally Seltmann‘s husband, Darren Seltmann, is the frontman of electronic pop band, The Avalanches, and specializes in pop tunes that fluctuate with touches of class and elegance, while Sarah Blasko is the most recognizable and well-known of the trio with her tender songs that often vary from crooning to folk/pop. 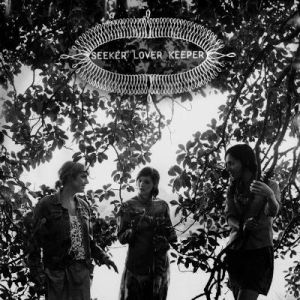 Seeker Lover Keeper is a record that oozes femininity, singing the truth of earnestly seeking love or at least, the elusive illusions of love and maintaining relationships, resulting in a thoughtful elegance creating the perfect conflicting amount of positivity, brightness, negativity, moodiness, and casual darkness. The opening four tracks are just stunning, catchy, and smooth. My personal favourite is “Theme 1,” which captures mystery with a bit more gravel to their sweet angelic voices. With “Everytime” Seeker Love Keeper deliver a little bit more urgency and edge with the use of simple acoustic guitar and simple drums. Then the prettiness kicks gorgeously back in on “We Will Know What It Is.” This album is all about the vocals with the very sparse use of instruments; one of those albums when you’re in that mood… delightfully, soulfully, pretty.